Need a new Hitch for your excavator or backhoe? OZ Excavator Buckets manufacture and supply Hydraulic Quick Hitches, Manual Half Hitches and Tilting Hitches for a wide range of backhoes and excavators. Pickup measurements designed to customers’ requirements. Easy to use on any machine and attachment. Hydraulic hitches are fitted with low maintenance heavy duty cylinders. Strong and durable construction to withstand robust working conditions. Fully compliant with all safety regulations. Auto-lock with double locking mechanism – already mandatory in NSW, this important safety feature will be rolling out Australia-wide shortly. Independent mechanical locking tabs on both pins – meaning the bucket cannot accidentally release if a hose breaks, or if there’s an unexpected drop in hydraulic pressure. Safe detachment positioning – ensures a bucket can only detach when the excavator is in the safest position, avoiding the risk of a bucket being dangerously detached. Front and rear visual indicators – let the operator clearly see when the bucket is locked on and properly engaged from the cab of the machine. Our hitches meet AS4772-2008 and NSW WorkCover & WorkSafe regulations. You can work with confidence, knowing you have the equipment you need to do the job safely. Thanks to their lightweight design and fabricated (not cast) construction, our high quality hitches are built to give you years of trouble-free service. OZ Excavator Buckets can supply our hitches in all brand colours to match your machine seamlessly. And thanks to their advanced multi-coupler design, they can easily pick up most excavator attachments in the same class. Along with their durable high-strength steel construction, OZ Excavator Buckets’ hitches are supplied complete with dipper pins and SWL Certificated lifting eye. 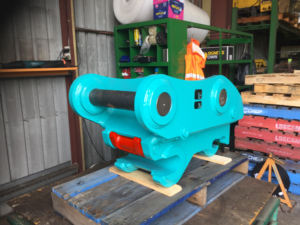 We manufacture high quality hitches for all types of machines available in Australia, including popular brands such as Airman, Bobcat, Case, Caterpillar, Doosan, Hitachi, Hyundai, JCB, John Deere, Kobelco, Komatsu, Kubota, New Holland, Samsung, Sany, Sumitomo, Sunward, Takeuchi, Volvo, Wacker Neuson, Yanmar, and many more. 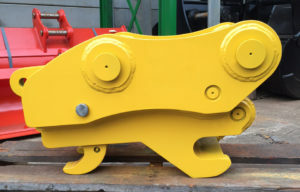 Get your Hydraulic Quick Hitch or Manual Half Hitch quote today! We make it so easy to get the attachment you need. Just click 'yes' above and we’ll send you a copy soon. Why choose an Australian excavator attachment manufacturer? The survey says – OZ Excavator Buckets provides great service! Fast turnaround? Absolutely! We’re committed to meeting all your excavator attachment requirements. Phone: 1300 246 009 | Address: 7 Argon Street, Sumner Park Queensland, Australia 4074 | Copyright ©2019 All rights reserved.